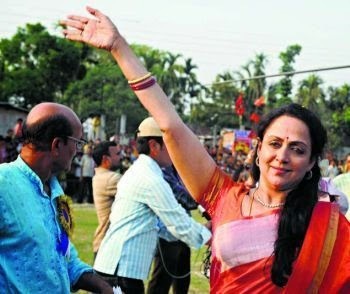 Actress turned politician Hema Malini to contest from Mathura seat in UP on BJP ticket in Lok Sabha Election 2014. she will contest against sitting MP and RLD leader Jayant Choudhary, Son of RLD chief Choudhary Ajit Singh. BJP has finally announced that LK Advani will be contesting from Gandhinagar in Gujarat and Narendra Modi will be contesting from Vadodara. LK Advani. PTI LK Advani. PTI The party released its 5th list of candidates today. Among them are actress Hema Malini, who will stand from Mathura, and Jagadambika Pal, who has just joined the BJP, will stand from Domariaganj in UP. Among other the party's other candidates are Olympic-medal winning shooter Rajyavardhan Singh Rathore, who will contest from Jaipur Rural; Ashwini Chaubey, who will contest from Buxar in Bihar and NCP leader and Maharashtra minister Vijaykumar Gavit's daughter, who has been given a ticket from Nandurbar.